It feels like full-on summertime right now. And nothing makes me happier. My one summer ritual is to go to the Farmer's Market each Saturday morning and buy a bag of fresh peaches. In summer, I don't think you can really have too many peaches. I'm reminded of that hilarious Will Ferrell SNL "More Cowbell!" skit about Blue Oyster Cult recording the song "(Don't Fear) the Reaper." At the climax of the skit, THE Bruce Dickinson (aka Christopher Walken) exclaims, "Guess what? I got a fever, and the only prescription is more cowbell!" I kind of feel the same way about summer. I got a fever and the only prescription is more peaches! I've been muddling them, grilling them, freezing them, you name it. This is my latest preparation. I think I actually made it three times in a week. 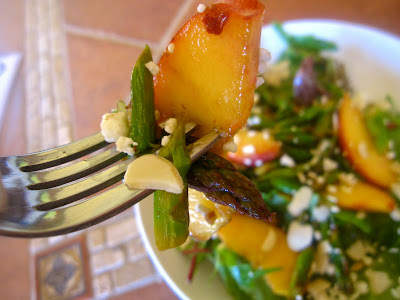 Peaches, asparagus and goat cheese prove to be a fantastic combination for a salad. It's delicious, not to mention healthy. I can kind of fall off the health wagon on the weekends, so it's nice to find something I can really savor that I don't have to feel guilty about (unlike the pizza-by-the-slice at 2 am). 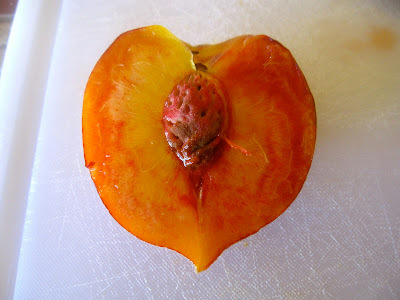 While the components of the salad can be prepared ahead of time, you do have to wait to slice the peaches until you're ready to serve the salad to avoid discoloration. The reward is great for very little effort. So go out and get some fresh peaches and enjoy the glory of summer! 1. In a large skillet over medium heat, saute the asparagus in one tsp olive oil for about 4 minutes until bright green yet tender. Add garlic, lemon zest and red pepper flakes and cook for one more minute. Remove from heat and squeeze the juice from half the lemon on it. Add salt and pepper to taste and set aside. 2. Make the dressing by whisking together the vinegar, juice from the remaining lemon half, shallot, dijon mustard, and 3 Tbsp olive oil. Add salt and pepper to taste. 3. In a large bowl, toss the lettuce with the dressing. Top with the asparagus, cucumber, cheese, almonds and peaches. Serve immediately. it may be one of the funniest SNL skits of all time. it's will ferrell in his most unabashed glory. jimmy fallon can't stop cracking up right in the middle of the skit. i've seen it a million times and it's still just as funny. i am not sure how this relates to peaches, but who cares. Made this salad for a dinner party and it was a big hit among a very foodie crowd. I love the toasted almonds both for the rich nutty flavor and the texture. Great recipe!